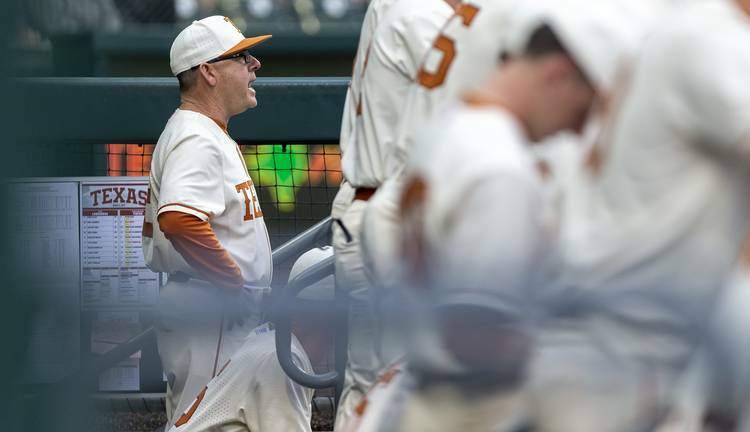 David Pierce conceded on Tuesday that his baseball team still has “to fill in some blanks,” but the Longhorns started their week with a 7-2 win over Lamar. The victory came a couple of days after Texas unexpectedly lost twice to Kansas State in what was only the second conference series dropped at home in Pierce’s three-year tenure. After the loss, Pierce challenged his players. He also met with each of the Longhorns to list their strengths and ways they can help the team. Tuesday’s triumph gives UT some relief as its heads to Oklahoma State for a three-game series that begins on Thursday. Oklahoma State (22-13; 7-5) and Texas (24-15; 5-6 Big 12) are currently the conference’s second- and seventh-place teams. “These guys, they understand what’s at stake. They don’t want to lose, they want to play well,” Pierce said. After scoring four times in the third inning on Tuesday, Texas never had its lead shrink below three runs. The Longhorns added runs in the fifth and seventh innings. Senior catcher Michael McCann then hit an eighth-inning homer after entering the game as a defensive substitution. The early support on the scoreboard made a winner of Matteo Bocchi. Over its first 10 midweek games this season, Texas did not have a pitcher get through five innings. Bocchi did just that on Tuesday. Following Sunday’s 2-0 loss, Pierce insisted that changes were coming. He followed through on that promise on Tuesday. Gauntt appeared behind the plate for the first time. Freshman Bryce Reagan, a 16-time starter at shortstop, made his inaugural start at second base. Coy Cobb pitched an inning of relief two days after losing his job as UT’s Sunday starter. The biggest change, though, involved Pierce. Against the Cardinals, it was Pierce instead of assistant coach Sean Allen who was coaching in the third-base box. Pierce said he will continue serving in this role, but he was quick to say that his longtime assistant had not been demoted. Around the bases: Gauntt singled in the first at-bat of his collegiate career. Gauntt was cut before this season, but he recently rejoined the team after the NCAA approved a Texas appeal to add him to its catcher-depleted roster. … Cobb, who threw 24 pitches on Sunday, walked one batter over his one inning out of the bullpen. … Lamar shortstop JC Correa, the younger brother of Houston Astros star Carlos Correa, went 1-for-3 with a walk and RBI. … Texas sophomore first baseman Sam Bertelson recorded the first steal of his collegiate career.